Just like you, your dog is going to get sick occasionally and you may come home from the veterinary practice with some medication to administer. Learning how to do it right will make the process easier both for you and your dog. Always follow the instructions given by your veterinary surgeon. Be sure to administer the full amount of medication over the number of days instructed by your veterinary surgeon. 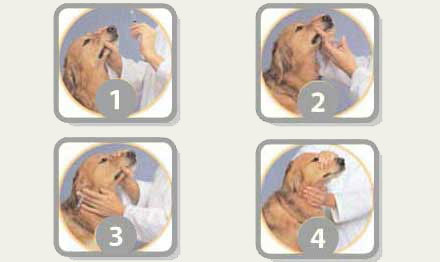 Gently squirt the medication into the pouch between the teeth and cheek. Stroke the throat or blow on his/her nose to encourage swallowing.